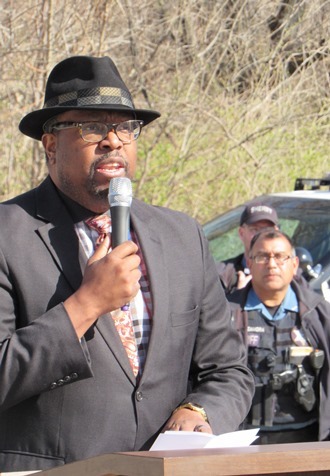 MLK commemorated at program at John Brown statue in KCK – Welcome to Wyandotte Daily! Kansas City, Kansas, delivered a powerful answer to hate and intolerance on Wednesday afternoon at the John Brown statue at 27th and Sewell. The event was a commemoration of the life and work of Dr. Martin Luther King Jr, marking the 50th anniversary of Dr. King’s death on April 4. It was a community event with several groups participating. 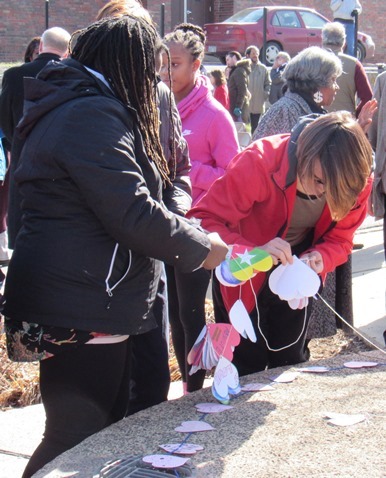 The program also was an answer to the vandalism with hate slurs discovered March 18 at the John Brown statue. Students placed garlands around the John Brown statue, which was vandalized last month. The statue honors Brown, who was an abolitionist in pre-Civil War days. Students for KCK Values participated in the program Wednesday, with help from teachers, and from the staff from the Boys and Girls Club. More than 100 persons attended the program. The vandalism at the John Brown statue was noted by speakers at the program Wednesday. Megan Dorantes, a junior at Sumner Academy, said anger starts to build up inside of people who encounter injustices. 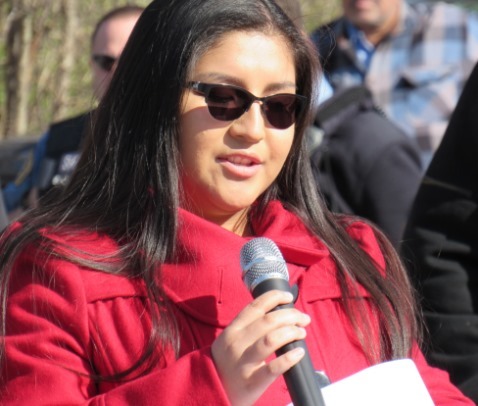 “But instead of starting riots, and destroying property, I got involved,” Dorantes said. “Martin Luther King impacted my life by teaching me that instead of taking out my emotions through violence, I should rather share them in a peaceful manner. The minute you revert to violence is the minute that people no longer understand you and listen to you. Without him and the civil rights movement, I wouldn’t be able to stand here today and give you this speech. “We may think that the civil rights movement is finished, but we know that it’s far from over,” she said. Incidents such as those involving the death of Michael Brown and the vandalism of the John Brown statue are examples that the fight for equality and against racism is far from over, she said. 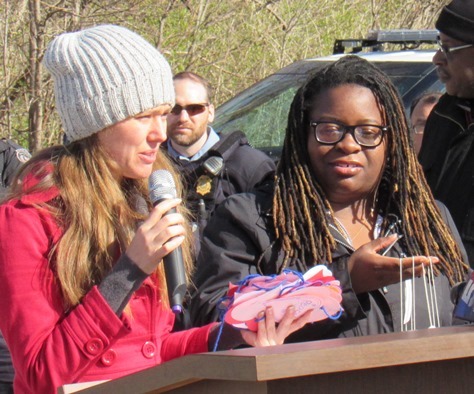 “Hatred is a lonely place to be, but love welcomes a community,” she said. Education and getting involved will solve the problems of racism and injustices, she said. Tamra Miller with Sumner Academy said students there wanted to make a visual statement in response to the vandalism of the John Brown statue. 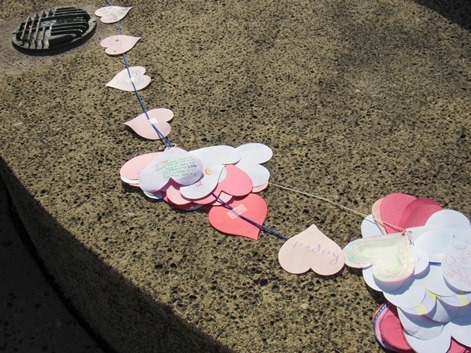 Students created hearts on a garland with messages such as “seek joy” and “we rise together.” Educator Shanette Dinkins and graphic design students at Wyandotte High School also participated with discussions and making a garland. One resident who attended the event, Christine Allen, said she felt that it was a good tribute to the past. “The future is on its way, we must keep our values up and have grace and dignity,” she said. Public officials also spoke at the program. Johnson also quoted Dr. King’s statement that the nation must undergo a radical shift of values, changing from a theme-oriented society to a person-oriented society. Johnson quoted Dr. King as saying, when machines and computers and profit motives and property rights are considered more important than people, the giant triplets of racism, extreme materialism and militarism are incapable of being conquered. Dr. King’s words, though spoken over 50 years ago, are still prophetic, Johnson said. In fact, those moments in many ways served as a commitment for the next phase for the struggle for what was right for the whole of society, he said. 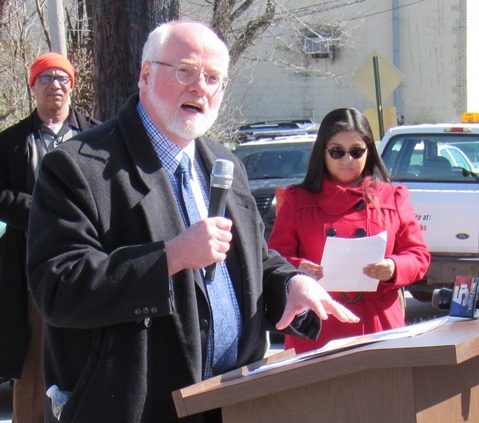 Mayor David Alvey spoke about Dr. King’s vision. “When we honor Martin Luther King, we honor his vision of what America was meant to be, and what it can be, in fact, what it must be,” Mayor Alvey said at the program. 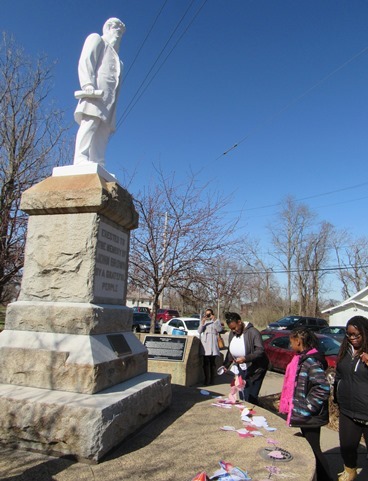 Alvey recognized Officer Dennis Vallejo of the Kansas City, Kansas, Police Department, who volunteered to clean the statue after it was vandalized. 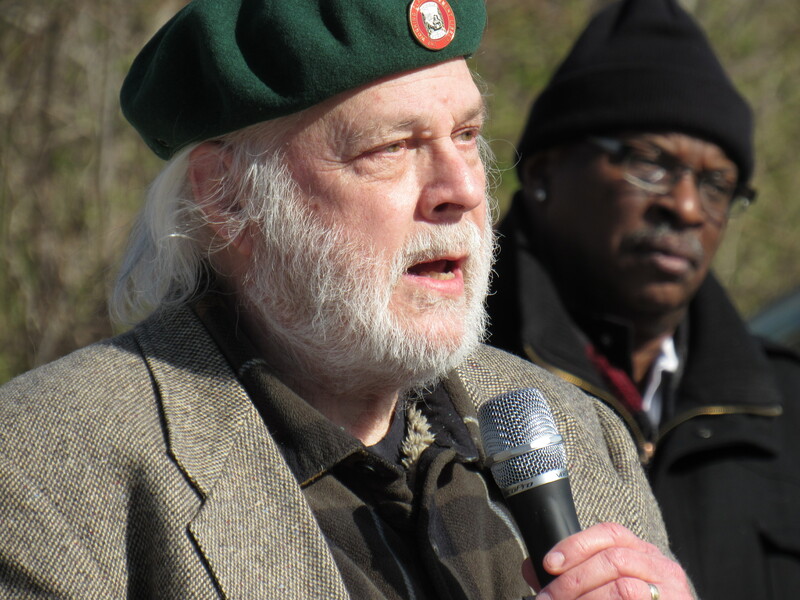 Also as part of the program, Dr. Fred Whitehead gave a brief speech about the history involving the John Brown statue. In 1910, a segregationist was elected mayor of Kansas City, Kansas, and in response, the African-American community raised funds to erect a statue of abolitionist John Brown, Whitehead said. African Methodist Episcopal Church members collected nickels, dimes and quarters to pay for the statue. In 1910, Western University was in the Quindaro area near 27th and Sewell, and when the statue was unveiled in 1911, thousands of people attended the ceremony, he said. 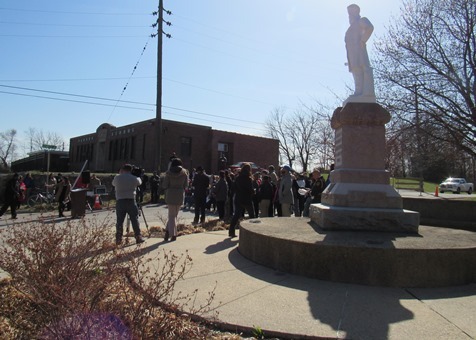 Whitehead mentioned Officer Vallejo’s efforts to clean the statue after the vandalism March 18 of this year, as well as former Mayor Joe Reardon’s role in restoring the monument several years ago. “We will never forget, never abandon it,” Dr. Whitehead said. Many thanks for this fine, detailed report on our event, the best one published so far. What a wonderful uplifting story! I wish I could have been there. And thank you, Fred, and all others for this report. 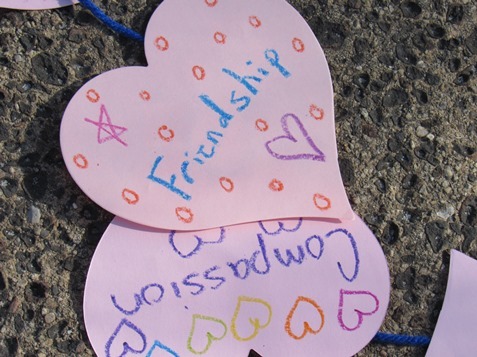 It is so important for so many of us – in every community. I appreciate it. And I’m certain appreciation will grow throughout the years. just plain terrific. And for all who attended, may I recommend a fabulous brilliant an entertaining collection of short stories by National Book Award winner Charles Johnson: Dr. King’s Refrigerator and Other Bedtime Stories. The spirit in this book and the gifts of grace are so great I wish to share them with as many people as possible. Thanks. Ernie Brill.